Every year, I set a two-word intention. It's helpful. I tend to stick to the spirit of those two words far better than I ever did with actual new year's resolutions. This year, because I (cough) love a challenge, I chose these words: Here Now. I regretted it almost instantly. It's so dang hard to refrain from worrying about the future (my personal specialty) or ruminating on the past (ok, I am pretty good at this too). Of all the two-word intentions I've set over the years, this one has been the hardest. The simplest, but the hardest. It's like that saying is true: humans make plans, and the Universe laughs. I had some side effects to a medication earlier in the year, the worst of which was a six-week stretch of nausea and retching. It was so severe that I dislocated a couple of ribs. Also, it stopped me sleeping through the night, and THAT made me crazy. Like, way more than my usual crazy. Always check what side effects medications have. Ask the googles, and don't just trust your doctor. Not that I am bitter or anything. It's quite easy to be in the moment when said moment is enjoyable. It's a whole other thing when it involves sleep deprivation and retching. So it's been six months of practice. Practice at relaxing into whatever turns up. Practicing being gentle with myself when I feel like crap. Practising being here now, with varying degrees of success. In the end, what really helped me turn the corner wasn't anything I did, but rather, allowing someone else to help me, so I could just be. Karen suggested I try manual lymphatic drainage, a form of massage designed to help your lymph drain. The lymphatic system is our body's detox system: it's meant to move excess hormones, including the stress hormones adrenalin and cortisol, out of the body by mopping them up and fluidly transporting them to the organs of elimination. Lymph relies on muscular movements. Unlike blood, there is no heart to pump it back up to the chest for drainage. If you don't move enough, neither does your lymph. Which means if you've been lying still because you've been ill, or your body is misaligned (like, say, dislocated ribs) or you've had a surgery, you end up with a buildup of fluid with all sorts of nasties in it. It's probably not quite as nasty as when you get a blocked drain at home, but the net result is similar. After the first treatment, I felt deeply at peace - and I slept really well, for the first time in months. Also, the pool of lymph in my right chest, which I'd thought was muscle tension, and which was restricting my neck and arm movement on that side, is gone. Right now, I'm finding it much easier to be here. Much easier to just be. Being here, now is probably a practice for a lifetime, rather than a few months or a year. But I've made progress! Turns out you can't always do everything by yourself. Sometimes, you need to give up control and just be. Let other people help you. PS: If you want to work on your own intentions & attitudes, you can download your very own yogAttitude Kit for free here. If you want to try out Karen's amazing massage skills click here. When I tell people this, they often look at me in wonder, and I’m pretty sure they’re imagining that I spend an hour a day standing on my head, or doing 108 sun salutations every morning. Nope. Some days I do five minutes. Nothing more. I only stand on my head rarely and I probably only salute the sun once a week. This is enough. This still counts as doing yoga every day. Once I finally got it into my head that one minute of yoga as often as I'm able is better than, say, three hours of yoga once a week -- that is, regularity is more important than the length of any given yoga session -- doing yoga every day became easy. So how much is enough? How often is enough? How dynamic a practice is enough? Is simply lying on the floor really yoga? Here’s the thing: whatever you’re doing, it’s probably enough. Truly. This applies to individual yoga poses too. Yes, not every yoga pose will always feel like the most blissful place to be, but you want to feel like you can cope with where you are. Because when we're coping with where we are in a yoga practice, we can build up the strength and flexibility to move on—either to something more, or just something different. If we're not coping, building anything is awfully difficult. This is true of other parts of life too, of course, and those signs that you might have gone a little beyond 'enough' are pretty good ones to watch out for off the yoga mat too. The other thing to remember is that 'enough' changes, on and off the yoga mat. It depends on what's going on in your life—and what's enough for you might not look the same as anyone else in the yoga class or in your life. And that's okay. So take a mental load off (and a physical one too, if you like): you're probably doing enough. Are you hunched over at a desk right now reading this? Yes? Don't worry. I'm hunched over at a desk writing it. Tell me, are your shoulders sore? Mine sure are. Sore shoulders is pretty high up on the list of things my students (understandably) complain about most. For the most of us (and I'm definitely included in this), that soreness comes from what I call Hunchy Desk Posture, because so many of us sit at desks and peer at screens of some description for many hours a day, most days of the week. Look familiar? Suzy came into this pose and immediately said, "Ouch!" If you're used to holding your upper body in this kind of shape, chances are that you also bring this shape into many of the yoga poses you practice. Unfortunately, this puts all sorts if weird pressure on joints, tendons, ligaments and muscles to do things they're really not supposed to. Doing so can, and often does, lead to those sore shoulders and—worse—injury. So we want to counter Hunchy Desk Posture. 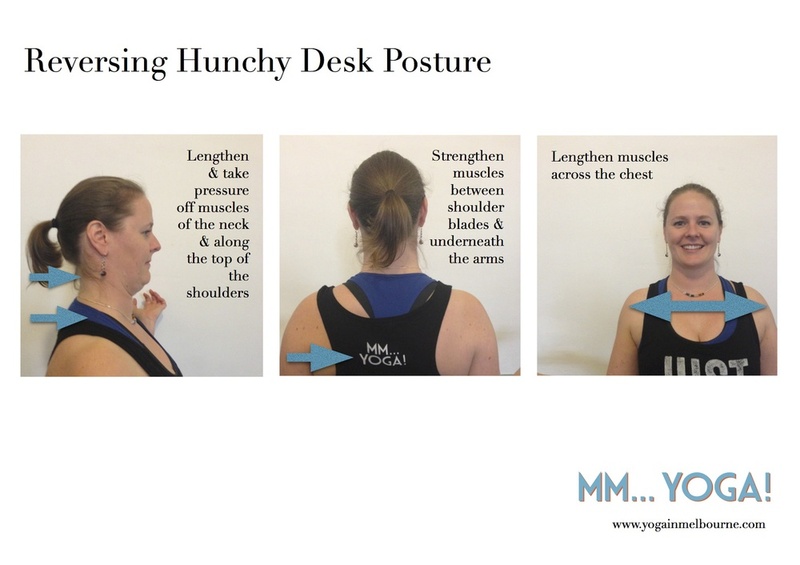 The good news is that if you know a little bit about how your shoulders work and which parts of them should be doing what kind of work, then you can begin to correct this stuff yourself (and alleviate tension, tension headaches and that anxious feeling) just sitting at your desk. The muscles that run from the top of your shoulder blades, across the top of your shoulders and up your neck to the base of the skull have to do all the work. They don't like this very much. And it usually means they're tense and feel a bit like a rope. To begin to counter that, you need lengthen the spine at upper back and and neck, well, upwards, rather than forwards. Try this: sit tall, and without letting your head drop forward, pull your chin back towards your throat and make a double chin. Suzy's comments on this pose: "All of the chins..." Think of that as you do it—it helps! Notice how you're suddenly sitting up taller? Hopefully the top of your shoulders have relaxed a little too. Sit here a while, then relax. You also want to try to strengthen the muscles between your shoulder blades and underneath your armpits. 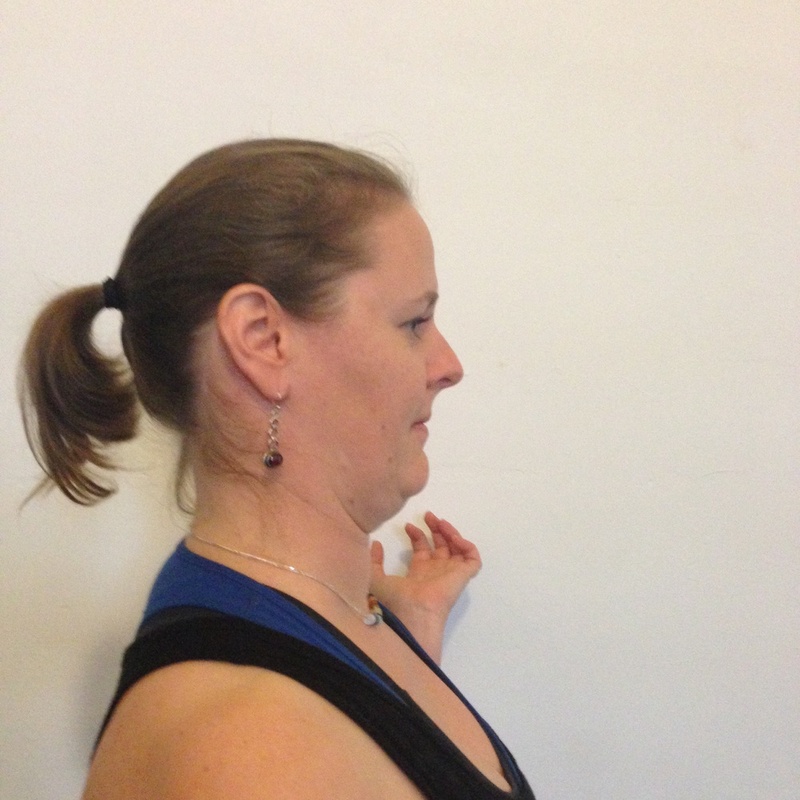 Try this: sitting, draw the bottom section of your shoulder blades towards one another at your spine. At the same time, let the bones of your upper arms rotate in your shoulder socket so if you bend your elbows your hands stick out to the side (I like to call this Pre-Shrug Pose). Look at that smile! You too can be this happy about relieving shoulder tension. Now add in the double chin exercise. And, most importantly, breathe slowly. The slow breathe should help to let the body know that it's okay to let go of that tension. And here's the trick: do this for a minute or so whenever you notice that you're sitting all Hunchy-like. (And if you're anything like me, that will be embarrassingly often). Regularly reminding your body in this way starts to change posture habits, which most of us have been practicing again and again for many years. There are also some yoga poses you might like to practice to lengthen the muscles across the chest, strengthen the muscles between your shoulder blades and under your arm pits, and take the pressure off those poor muscles across the top of your shoulders and up the back of your neck that have been desperately trying to stop your head from falling off. Play around with the double chin exercise, and the rotation of the arms and drawing together at the base of the shoulder blades in each of these postures. Breathe. mm...assage at work! So good for you. You probably need a massage. At work. It's a great way to revive and energise a tired desk bound body. It's really convenient as the massages are done on a massage chair or even at your desk so that it doesn't interrupt the work day. No oils are used and you can be massaged in your work clothes. Relieving muscular tension and aching back muscles, reducing stress levels, increasing focus and productivity are just a few of the benefits. , or as extensive as the body of yoga research, studies do tend to show that people derive immediate benefit from the massages. Over the longer term massage, like yoga, develops better body awareness. As your body awareness improves, you become better able to feel your aches and pains. It can feel like you are suddenly in more pain than before. Once you are aware of the knots in your shoulders, say, you can take steps to prevent them from forming in the first place. Karen was fantastic – I’ve even changed the height of my computer monitor this morning because of the huge knots she found in my shoulders! My other suggestions for self-care? Yoga and (more) massage of course. Love the idea. As a working mum of a 6 and 4 yo, and a 5 month old, all my exercise and personal time needs to be taken care of at work/lunchtime. So I cycle to the train station, and do the lunchtime yoga. Do leg lifts whilst doing the dishes, baby cuddles with lunges etc. So bring on the workhours massage. to find out how you can organise a massage therapist to come to YOUR office & ease your tight shoulders/neck/back and set you on the road to better body awareness, less pain and more health! Will yoga help me recover from injury? 11 sure-fire ways to hurt yourself in yoga.